A concierge chatbot is technology that allows businesses to provide information, reminders and helpful advice to customers. Compared to email, chatbot messages have significantly higher open and click-through rates. Facebook Messenger provides an easy entry into the world of concierge chatbot creation for businesses. Did you know that 61% of marketers are using webinars to generate leads or revenue for their business? And yet, marketers continue to voice concerns about low webinar attendance rates. For marketing related webinars, the rate of registrants that actually attend the event hovers around 42%. If you can get your webinar attendance rate up above 50% you are doing very well for yourself. There are ways to improve attendance rates. One of my clients offers continuing education (CE) credits to webinar attendees and they enjoy attendance rates between 50% and 60%. Most webinar hosts, however, don’t have an opportunity to offer CE credit. In another #MartechMonday post, I’ve written about how you can create a chatbot in about 10 minutes. I’ve also written about some Facebook Messenger’s recent product releases that make chatbots a more potent marketing solution. In this post, I’ll be showing you how setting up a concierge chatbot can help increase attendance rates for your webinars. One of my colleagues who sells online marketing courses was doing a great job at getting webinar registrations. He often had over 6,000 registrants for each webinar. However, his attendance rates were lousy; only 10-15% would attend each webinar. He took steps to change the date/time of the webinar… It didn’t work. He changed his promotional tactics… It didn’t work. He altered the frequency and cadence of his email reminders… It didn’t work. We decided to build a chatbot to help augment his email reminder system. When people registered for the webinar they were shown a call-to-action on the registration thank-you page to get reminders inside of Facebook Messenger. They also received notices in the confirmation email and subsequent reminder emails urging them to request reminders in Facebook Messenger. With these calls-to-action, about 2/3 of the registrants also opted-in to receive reminders via Facebook Messenger. With a mix of Facebook Messenger and email reminders, this individual saw the attendance on his webinars increase to between 18% and 42%: a 2x improvement over his old method. He has continued to use his concierge chatbot over the last three months and has continued to see these 2x improvements in webinar attendance. How does a concierge chatbot work? First, let’s briefly discuss how a chatbot works. With over 1.2 billion users, it is likely you’ve already used Facebook Messenger in some fashion. If you have a Facebook account and a friend has ever sent you a message through Facebook, then you’ve used Facebook Messenger. A chatbot lives inside a messaging platform (Facebook Messenger, Skype, Twitter, Slack, etc.) and enables human-like dialogue with a computer. For example, if you want to order a pizza, you can pull up Facebook Messenger and type in “Pizza Hut” in the search bar. It’ll bring up the option to talk with Pizza Hut. What it doesn’t tell you is that you’ll actually be participating in a computer-moderated conversation with a chatbot. The chatbot will present you with options that you simply click on to place your order. This is a concierge chatbot with the sole purpose of helping you place a pizza order. A webinar reminder concierge chatbot has the purpose of helping an individual register for a webinar, and then sends reminders to the participant about the webinar three days before, a day before, and then minutes before the webinar to ensure the registrant actually attends. Sounds complicated to build, right!? It is actually quite easy and requires absolutely no programming knowledge. In this article, I showed you how you can build a more general chatbot, and below I’ve got some pointers to help you get started with a webinar concierge chatbot. What are the benefits of chatbots over email? Email is still one of the most valuable arrows in a marketer’s quiver, and that isn’t going to change anytime soon. Email marketing is generally one of the surest and timeliest ways to get a message in front of your audience. 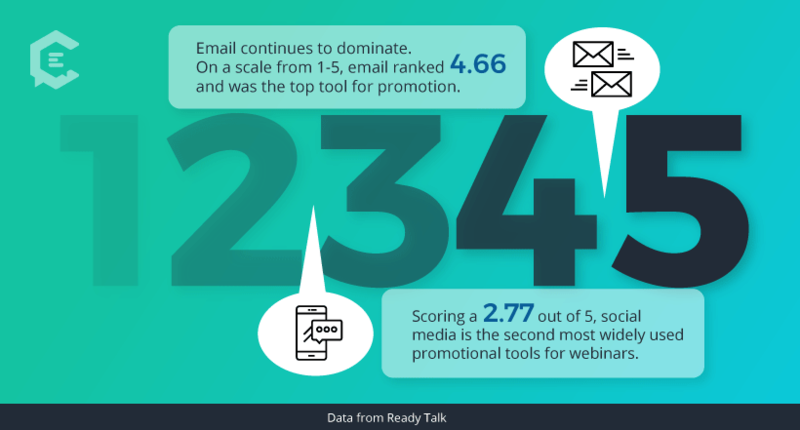 In fact, research from ReadyTalk, another leading provider of webinar software, shows that on a scale of 1 to 5 webinar hosts rank email at a 4.46. Average email open-rates are south of 25%. A 5% click-through rate is considered above average. Chatbots, on the other hand, enjoy extremely high engagement rates, from the side of opens (users viewing the message) to click-through. I gave a “how to build a chatbot” training for the Social Media Marketing Society a few weeks ago, and in preparation for that training, I did extensive research between email marketing engagement rates and Facebook Messenger chatbot marketing engagement rates. The below slide summarized my findings. Notice that in the email example, I used above average open and click-through rates. I’ve launched a lot of chatbots for clients, and the numbers shown on that side are quite consistent with the engagement rates my clients have been seeing. 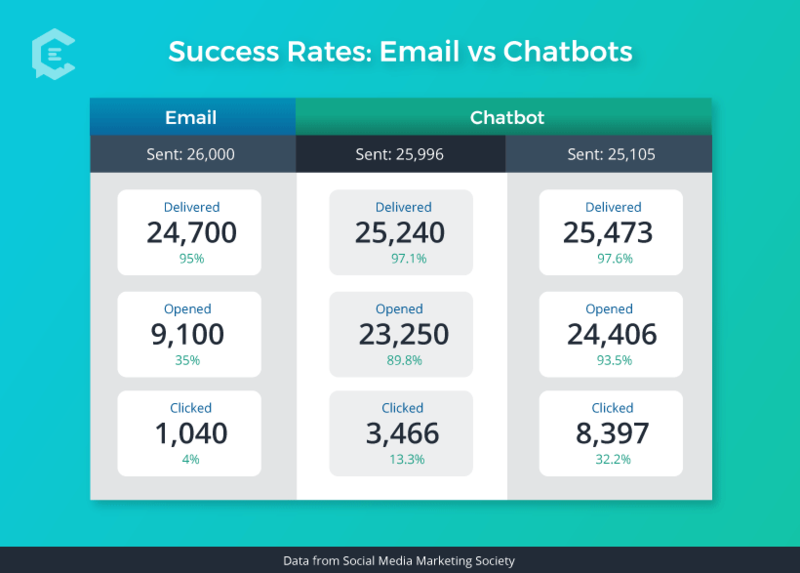 Even with modeling the comparison off above average email rates and standard chatbot rates the chatbot outperforms the email by three to eight times! The main reason why chatbots are so effective, in comparison to emails, is that any of your audience who had Facebook Messenger installed on their phones (which is likely most of your audience) will receive a little “ping” sound and a notification from Facebook Messenger as your message comes in. People are so accustomed to receiving messages from friends on Messenger and from spammers on email that the chatbot notifications continue to outperform email. There is a slew of research that has been done around webinar promotion outreach. General best practices call for promotion to begin 2.5 weeks before the webinar. But what about post-registration, pre-webinar reminders? How frequently and at what cadence should you be sending reminders? While reminder outreach timing varies greatly between industry, two reminder cadences that I’ve seen working the best with all my clients is to have a reminder going out the day before and then again one hour before the actual webinar. If you use a variety of outreach types (outlined below), then you should be able to get four or five reminder messages in via your chatbot, without seeing any audience burnout. Use video: It is a webinar host best practice to do a dry run a week or so before the actual webinar. While on this dry run, have your presenter put themselves on webcam and record a 15-second clip of them explaining why their presentation is going to be so valuable. You can then share this video with your registrants a few days before the webinar to help them get excited and increase the likelihood of them attending. Use audio: Audio is another great format you can use to get in an extra pre-webinar touchpoint. I recommend you use a quick audio clip from your presenter saying thank you for registering. In addition to communicating thanks, have the presenter share a tip or a valuable snippet of content in the audio clip. This is a good touchpoint to deliver to someone right after they’ve registered. A nice thing about sharing audio on chatbots is that the audio will not auto-play. The registrant must click the little playback button. Ask for questions: Another great touchpoint you can use to get a reminder in is via a chatbot message soliciting questions. Let the registrant know that if they have any questions for the presenter they can ask them now and the presenter will try to cover them if time permits. Complete pre-webinar polling questions: Most webinar platforms have an audience polling feature. I always recommend that my clients use this at the beginning (and sometimes during) presentations to make them more interactive. You can do little polling questions through a chatbot before the webinar to gather feedback that could be helpful to the presenter. You can also ask questions that help you segment perspective customers into specific audience segments! Morning of reminder: An hour or two before the actual webinar it is good to send a friendly message on Facebook Messenger reminding the registrant about the webinar. That way they’ll have time to clear out any conflicts that may have arisen between the time they registered and the actual webinar. 1 Minute before the webinar: Right before the webinar starts you should send a message letting your registrant know the webinar is starting, and invite them to jump into the webinar. Depending on the chatbot platform you’ve used you may be able to include a direct link they can click to be taken into the webinar. Now that you’ve got a good idea of when to do reminder outreach, and some of the types of touchpoints you can use, let’s get into how to set up a stage of the webinar concierge chatbot reminder program. In an earlier blog post about building chatbots, I gave you a thorough run-through on how to set up a bot, and so in this how to segment I’ll instead be focusing on teaching you how to do a broadcast reminder. Also, in the previous training, I used a tool called ChatFuel. For a little variety, I’ll be teaching you ManyChat in this article. Both platforms are excellent and I heartily recommend either for you to use! ManyChat gives you a lot of awesome message type options. Depending on the reminder type you’re sending you may want to use images, video, audio, or just text. 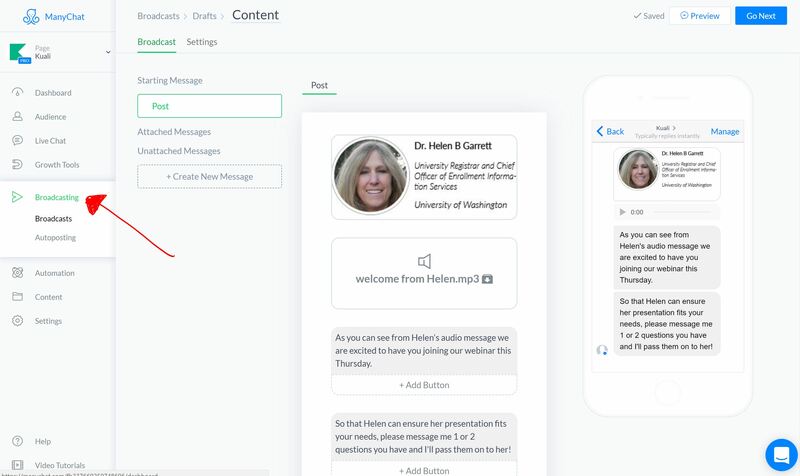 In the example below you can see that I’ve selected an image (with the picture, name and title of the webinar presenter) followed up by an audio clip of the presenter teasing her webinar content. Then there are two text boxes which provide a reminder and ask for the registrant to submit some questions. After you’ve created the content of your broadcast reminder message, you click the “Go Next” button and it’ll take you over to the settings. Steps 2 through 6 all occur on the settings page of the broadcast. On the targeting step you can use point and click logic to select who you want to receive the reminder. As people register for the webinar you can set a tag on their account, and then in this step you can say to send the broadcast only to those who have that tag set to true. Here is a feature that makes ManyChat stand out from the competition: the ability to schedule your messages to “time travel.” If you select “time travel,” then it will send based on the time you’ve scheduled for the message to go out, for the specific individual’s time zone. This is nice if you have a global webinar and don’t want people in Australia to receive your chatbot reminder the same time as individuals in the USA. Notification settings have a variety of options, each with their own nuance. What I recommend for webinar reminders, however, is that you simply select the “Only 1 regular notification” option. This will ensure that your reminder will trigger just one audible notification on their phone, and display the notification in their notification bar or lock screen. This is perhaps the best step, because it feels so good to build a reminder like this and then push Go. 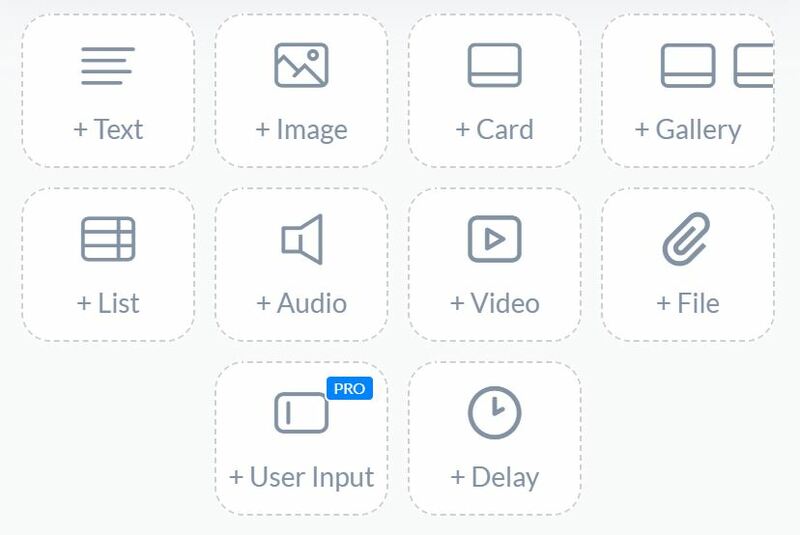 All you have to do when everything else is set up is click the little blue button, and it’s off! I do recommend, however, that you click the preview button before scheduling the post, so you can see what it looks like on your phone. When you click the button it’ll send a test message through to your Facebook Messenger app on your phone. AI Options for NLP (Natural Language Processing): Which to Use for Your Chatbot?